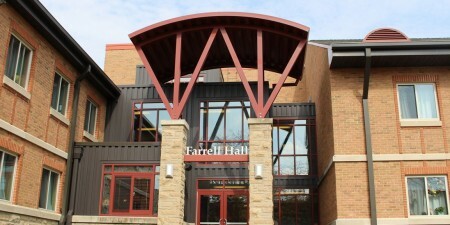 Maura Hall is part of what is referred to as the "main complex," as it connects to Canevin and Lowe Halls and the Administration Building. Each floor houses more than 30 residents along with a resident assistant. The floors contain single, double, triple and quad occupancy rooms. Like Canevin and Lowe Halls, the lower floors of Maura contain university offices and classrooms; the floors containing student housing have their own entrances and security. 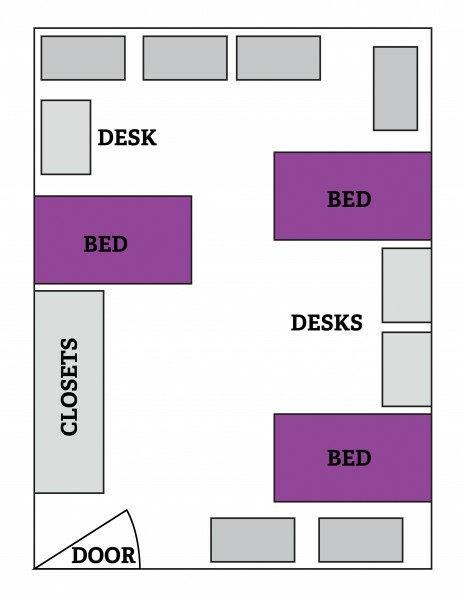 The dimensions of Maura Hall rooms vary greatly depending on room occupancy. The floor plan to the right is an example of a triple-occupancy room. Each occupant will have a bed with mattress, a closet and/or wardrobe, a chest of drawers and a desk with a chair. Wardrobe with 2 drawers: 24" x 36" x 78"
Sliding door wardrobe: 22.5" x 39" x 60"
Vanity Mirror: 16" x 23"
Window dimensions: 35" x 48"
Dresser dimensions: 20.5" x 30.5" x 46" | 17.5" x 31.5" x 48" | 20.5" x 36" x 47.5"
Maura Hall windows can only fit portable air conditioners. A doctor's note is required. Please see our air conditioner policy for more information. Interested in Learning More About Different Cultures from Seton Hill Students? This residence hall features a “language and cultural immersion” floor. As a resident of this floor, you will interact daily with students from diverse cultures, and native speakers of a variety of languages. A resident assistant will assist with language skills, and you can participate in activities sponsored by the Office of Multicultural and International Services, the Modern Languages Program and the Spanish and French clubs. New students will be given the opportunity to request housing on this floor as part of the orientation process. Current students should contact the Office of Residence Life. Maura Hall connects to Canevin & Lowe Halls, Lowe Dining Hall, the Post Office and the Administration Building. Laundry facilities are available on each floor.